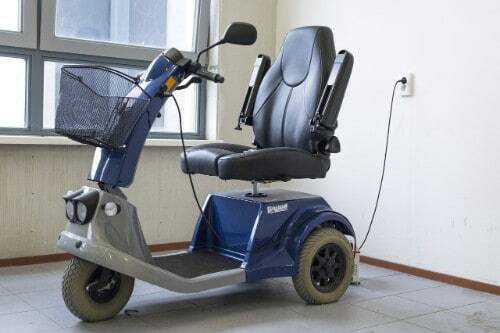 An electric mobility scooter can help limited-mobility adults reclaim parts of their lives that once seemed unreachable. Shopping, family outings, and even moving around the house can be difficult, but a mobility scooter can give you or your loved one their freedom back. Everyone leads a different lifestyle, and your mobility scooter should make you comfortable in yours. That's why we have chosen the best scooters for indoor use, outdoor use, and rugged outdoor use. If it is your first time buying a mobility scooter, there are several considerations to take into account before finalizing your purchase. Safety is always a concern if you are ever riding on the road, but also consider the range and charging time of your electric mobility scooter’s battery and how to deal with a situation where you run out of charge. Last but not least, make sure you can carry your scooter on the car, bus, and by any other transportation methods you use. Before purchasing your mobility scooter look to see how it is charged and how long it takes. Many scooters use gel lead acid batteries instead of the newer lithium ion batteries, so that they can be taken on airplanes and cruises. The downside to this is that gel lead acid batteries take longer to charge. Depending on which electric mobility scooter you buy, your batteries may take between 8 and 12 hours to fully charge. If you are not used to relying on battery-powered transportation, it may take some time to get into the rhythm of keeping your scooter charged. Besides the battery charge times, also take into account how the scooter charges. Depending on the electric mobility scooter, you may have to remove the battery to plug it in, or you may have to leave the battery on while charging. Most of them offer the option of charging either way, but check to make sure before purchasing. If you need to drive your mobility scooter to different places, it is obviously important that you be able to fit it into the car that usually carries it. It is also a good idea to make sure it will fit into other vehicles just in case. Measure your trunk or the back of your car, and make sure that the scooter is light enough to lift into the vehicle. Many portable mobility scooters easily break down into small, easy-to-carry pieces. Electric mobility scooters are for those who may not be strong enough to walk far or are at risk for falls. Users should, however, be able to stand and walk short distances unaided. If you are not able to move around unaided due to weakness or a medical condition, an electric wheelchair might be a more suitable option. They offer many of the same benefits as mobility scooters but are designed to be even easier to use and control. 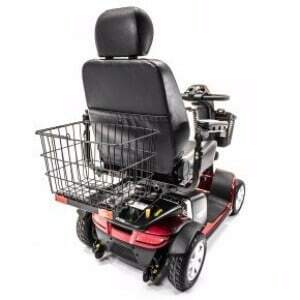 You can read our review of the best electric wheelchairs in the market. The 4-wheeled Scout from Drive Medical has enough stability and power to deal with grass, small curbs, and other minor obstacles found away from smooth tiled mall floors. The 4 wheels prevent it from tipping as easily as the 3-wheeled design, but this also widens its turning radius by about 20%, so it may be less convenient indoors or in other tight spaces. This electric mobility scooter comes with many of the same features found in high-end models but at a much more affordable cost. Stable – It will not tip over when turning at speed or on a slope. Upgradeable battery – If a 9-mile range is not good enough, upgrade to the larger battery size for a 15-mile range. Well designed – The design is well thought out and intuitive. Batteries are chargeable attached or detached from the mobility scooter. Larger turning radius – It might be inconvenient for use in small home spaces. Low clearance – The 2.5” ground clearance does not leave much room for bumps or obstacles to pass underneath. Small wheels - It does not do very well in snow, slush, or sand. No suspension – Cobbled streets or rocky ground will be bumpy. Visibility - The reflector on the back is a bit small, and there are no built in lights. Once the mobility scooter is assembled, the wheels need to be unlocked. To unlock the wheels, make sure that the red lever at the rear of the scooter is in the Freewheel position. Then, at the front of the scooter, find the knob at the base of the steering shaft that says lock and unlock. Pull the knob out and turn it to the unlock position. This electric mobility scooter scooter has 3 different height adjustments. The chair arms have both adjustable width and height. In many respects, 3-wheeled mobility scooters are comparable to those with 4 wheels, but mobility scooters with 3 wheels have an advantage in close spaces with tight corners like at home. The 3-wheeled mobility scooters are most useful on perfectly smooth floors and asphalt. Off the beaten path, however, they will be hard pressed to deal with even small bumps, curbs, and hills. Tight turning radius - At 39”, the turning radius is perfect for indoors. More leg room - The single centered front wheel frees up space for your feet on either side of the steering shaft. Gel lead acid batteries make the scooter safe for boats and planes. Battery - The scooter comes standard with a 12 mile range. Comes with an LED headlight. Stability – It may tip when turning at speed or on a grade. It has difficulty with any terrain that is not smooth. Batteries need to be removed in order to charge them. There is a universal 1 in (2.5 cm) hitch for accessories like an oxygen tank holder, but keep in mind that heavy accessories like oxygen tanks should be included in the maximum weight capacity. The 4-wheeled BuzzAround Extreme from Golden Technologies is rugged by mobility scooter standards. With suspension, larger wheels, better tread, higher ground clearance, higher weight capacity, a larger battery, and a more powerful motor, the BuzzAround Extreme is the ideal electric mobility scooter for when living life demands more than short shopping trips on smooth floors. Although the BuzzAround Extreme comes in both 3-wheeled and 4-wheeled models, the 3-wheeled model is usually unnecessary. The benefits of the BuzzAround Extreme come from its aptitude outdoors on grass, gravel, and other uneven surfaces. The main benefit of a 3-wheeled electric mobility scooter is the tight turning radius which is usually not a factor outdoors. If the scooter will mostly be for indoor use, I recommend the 3-wheeled Scout as it is more affordable, lighter weight, and the battery is upgradeable to a 15 mile range. Stable - It is difficult to tip over when turning at speed or on a slope. Larger turning radius - It might be inconvenient for use in small home spaces. Bulky - Even though the scooter breaks apart, it may be difficult to fit in the trunk of a small car. Batteries can only be charged while attached to the scooter. Tires: 9 in (23 cm) The standard solid rubber tires can be upgraded to pneumatic tires on the 4-wheeled version. The mobility scooter will not run on 1 battery. Both batteries must be attached. There are small anti-tip wheels in the back to prevent the scooter from falling backwards going up inclines. If you do not want an "old man" scooter, the EW-36 is the ride for you. It is no Ferrari, but topping out at 15 - 18 miles per hour on level ground with a 43 mile range, it certainly has more speed than other electric mobility scooters on the market. Unlike the other electric mobility scooters we reviewed, the EW-36 comes with the proper lights, horn, and mirrors to be street legal like a moped. Although it moves fast enough to make ten mile trips, it also has a max throttle dial that will keep you from accidentally running people down in the mall. Overall, it has a good combination of distance, speed, and control for outdoor activities and running errands. It may be a bit bulky for in-home use. Street Legal - The scooter comes equipped with the proper lights, horn, signals, and mirrors for driving on the road. Bulky - The scooter does not break apart like some of the smaller models. The batteries remain attached to the scooter while charging. The EW-36 Electric mobility scooter comes with a limited 3-year warranty. Can withstand light rain, but should not be gotten wet. Comes with digital anti-theft alarm. Comes fully assembled and ready to ride on a pallet. If you are purchasing a new electric mobility scooter, there are some popular accessories that can make your scooter easier to use and allow you to use it in a wider variety of circumstances. Oxigen tank holders have an universal attachment for most electric mobility scooters. 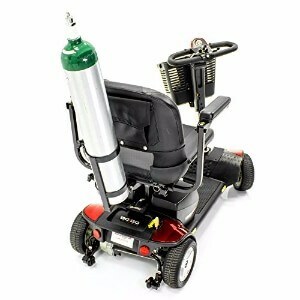 Cloth oxygen tank holders that attach to the back of the seat are much cheaper, but they often only work well with manual wheelchairs, or the oxygen tank will not be tight against the chair. A rear basket can be a very convenient accesory for an electric mobility scooter. Mobility scooters usually come with a small front basket for your personal things, but when you need extra carrying capacity for things like groceries, a rear basket can be very useful. Comes with reflectors for visibility. An arm bag on the side of your mobility scooter gives you easy access to any small accessories you carry daily like a wallet, glasses, a phone, etc. Polyester fabric with a water repellent coating that has an elastic bottom hem with adjustable strap for snug fit. Remember that mobility scooter storage covers are not travel covers, and some people have had problems using it as one. You will need zip ties or a different adapter to attach this to a mobility scooter as it is meant for a bike, but scooter-specific flags are more expensive and do exactly the same job. Plus most of the flags designed specifically for mobility scooters did not attach well to the scooters. Even though scooters have wheels, they are not considered a vehicle in the eyes of the law. When driving on a roadway, your scooter should be on the far left of the road facing traffic. Use pedestrian crosswalks and other road signs as if you were walking. Electric mobility scooters are also not for use in bike lanes. Sitting in a mobility scooter, you are shorter than normal and less visible to those around you, especially to larger vehicles like trucks and vans. Make yourself more visible by attaching reflectors to the front back and sides of your scooter. You can also attach a fluorescent red flag antenna to the back to make you more visible to larger vehicles. Even if you do not plan on driving at night, put lights on the front and back of your electric mobility scooter. Sometimes unexpected circumstances can hold you out past dusk, and once you need the lights, it is already too late. Scooter accessibility differs depending on where you live, but many public transportation methods are built for wheeled access. Contact your local transportation authority to find out what options are available to you. On the transportation authority website, they should list the maximum outside dimensions for scooters. Also, check special transportation services that may operate in your area. Often special buses with handicapped lifts are available. Purchase a carport power adapter that plugs into your car’s cigarette lighter, so that you can charge your electric mobility scooter’s battery while driving. When you first get your electric mobility scooter, give yourself some extra time to get where you are going. It can take some time to get used to following wheel accessible paths. Keeping your lead acid scooter batteries fully charged will make them last longer.